Colour can be transformative, both in terms of how it makes a home look but also how it makes you feel. It’s a way to express your personal style and change the entire mood of a room. Because it is so transformative, many struggle to make a decision and will often play it safe and stick to neutral tones. 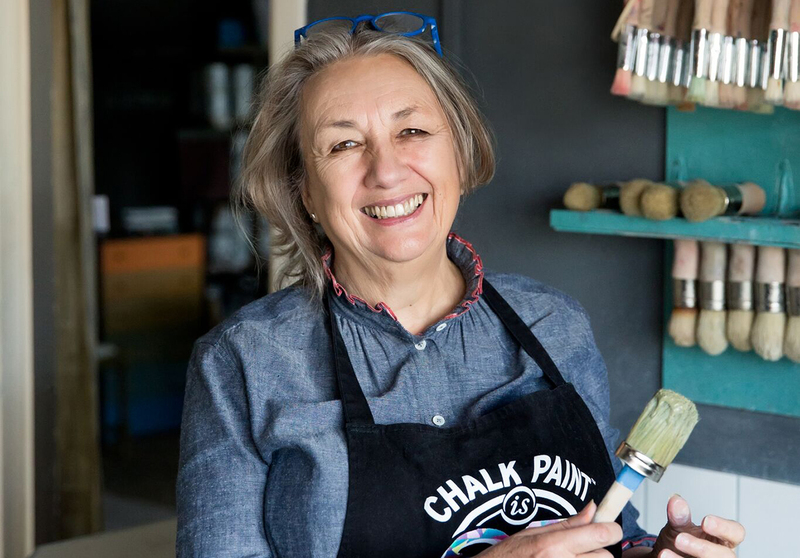 We sat down with Annie Sloan, one of the world’s most respected colour and paint experts, to discuss her own experience with decorating her workspace. Annie has never been afraid of colour and often errs of the side of adventure when it comes to choosing a hue. We’ve also teamed up with Annie as part of our SPACES exhibition, a celebration of London’s most pioneering women and the spaces in which they create. Annie is recreating her studio in the windows of our Tottenham Court Road which you can explore from 11th- 22nd September. Annie’s new workspace gave her the opportunity to have her writing area and studio in the same building, allowing her ideas to flow from one to the other for the first time. The space was large and uncluttered but with varying levels of light throughout, presenting a challenge when it came to choosing colour. Her writing area was unusual, as it had no outside windows – just one large window that looked into the studio making for quite a dark room with little natural light. The rich, deep blue created the perfect work environment for Annie to write. They key was to pick a warm-hued blue that had red undertones in it rather than green to keep things cosy rather than cold. A fresh lick of paint on an old piece of furniture can breathe new life into it. When it came to furnishing her new office space, Annie wanted to be a bit more adventurous. The first thing to consider was her desk – the place where she would be spending the most time. Instead she chose to mix her own. 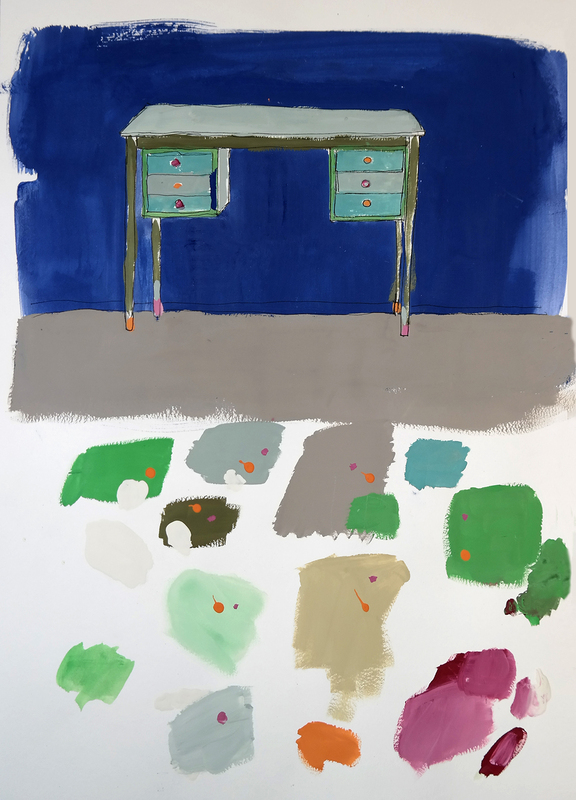 Having made a drawing of her desk, she started to colour it in with dabs of colours that she thought would go well together. “I love blue and green together, particularly Antibes and Napoleonic Blue, so I started with this adding some Duck Egg and Provence. Then I thought a tiny bit of some bright hot colour could be added. 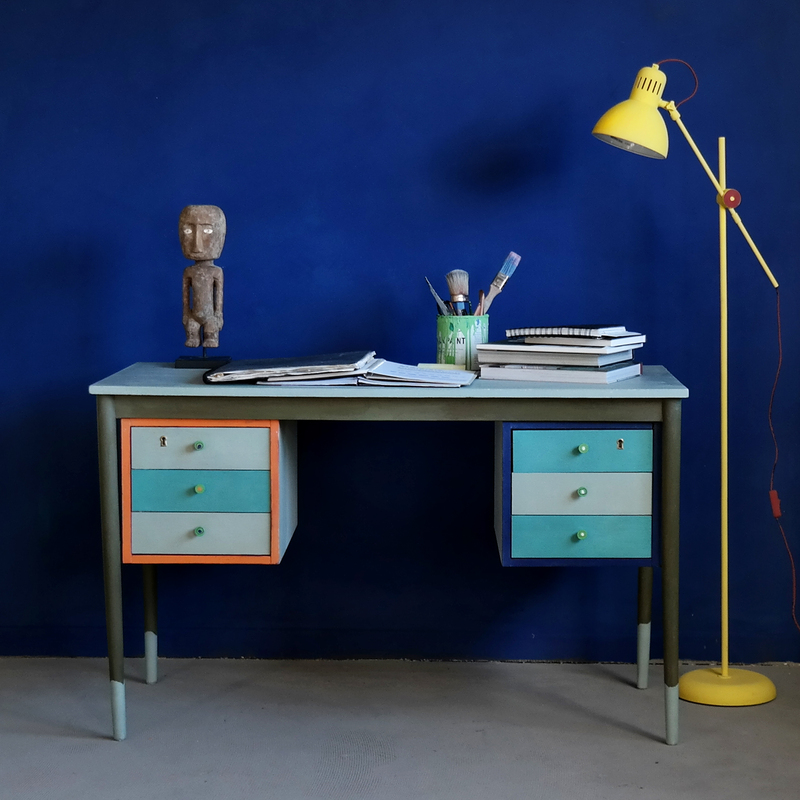 A little red and orange goes a long way too.” Annie settled on Duck Egg Blue lightened with a little Pure for the desk top, leaving her with a clean canvas that wasn’t too dark against the wall, but not so light that it contrasted. It’s always best to paint in the daylight and make up the colours in the room that you are planning to use them in. The quality of the light can make a huge difference to how the paint will appear, and you may need to adjust your colour mix to make it lighter, brighter, or darker. Annie’s final words of wisdom – “When working with colour, I have always erred on the side of adventure and, as a result, I have made a lot of mistakes! 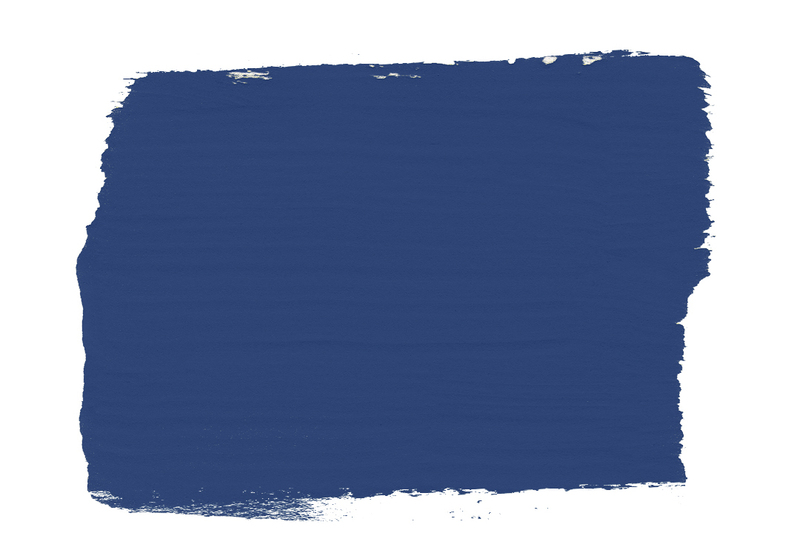 However, that is the way we all learn, and the great advantage with paint is that it can be reapplied so easily.” So if you find yourself hankering after bold hues, give it a try. Just be sure to test the colours in your room first, taking changes in light throughout the day into account. Annie’s recreated workshop will be available to explore at our Tottenham Court Road store from the 11th-22nd September as part of our SPACES campaign.